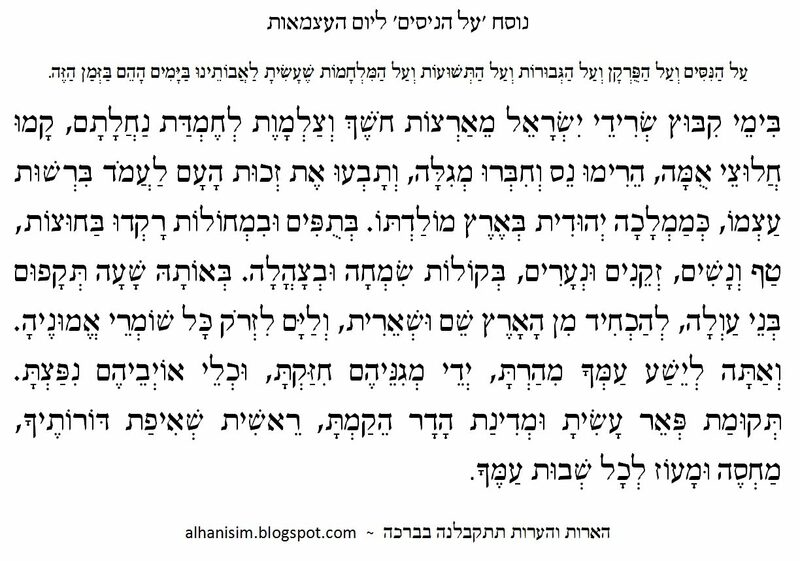 Last year, in honor of Yom Ha’atzmaut, my friend, Dr. Avi Shmidman, and I, composed a text for the ‘Al Hanisim’ prayer. We felt it was appropriate for the day and expressed the unique aspects and history of Yom Ha’atzmaut in a way that Hallel or other liturgy does not. Last year’s publicizing of the prayer succeeded beyond our imagination and was used by individuals and synagogues around the globe. For us, the prayer is a personal expression of thanks. We have consulted with Rabbis that have approved of the idea to insert it in the traditional location for Al Hanisim as well as those that have objected. We are merely sharing the result of our composition with a wider audience. Please consult with your local Rabbinic authority regarding the insertion of this paragraph into the prayers, and please feel free to distribute to others. And for the miracles, and for the salvation, and for the mighty deeds, and for the victories, and for the battles which You performed for our forefathers in those days, at this time. In the days of the ingathering of the remnant of Israel from the lands of darkness and the shadow of death to their beloved inheritance, pioneers of the nation arose, raised the flag, composed a declaration, and claimed the right of the nation to be established with its own consent, as a Jewish government in the land of its birth. With song and dance, women and children, the old and the young, celebrated on the streets with joy and rejoicing. At that same time, their enemies converged forthwith, to eliminate all trace of Israel from the land, and to push into the sea all the keepers of its faith. But You hurried forth to rescue your nation. You strengthened the hands of their defenders, and destroyed the weapons of their enemies. A revival of glory you made, a country of beauty you established, the beginning of the longing of the generations, a refuge and a fortress for the return of all Your people. 1. What about Yom Yerushalayim, have you considered writing one for that holiday as well? 2. Which rabbis did you consult who approved it? 3.can you publish a narrative of how you came to this nusach? I have found a study by Rabbi Jonathan Chipman discussing this. Thanks. Yom Yerushalayim is on our to-do list. You can find more discussion and background about this Al Hanisim at http://alhanisim.blogspot.com/. Warm regards.